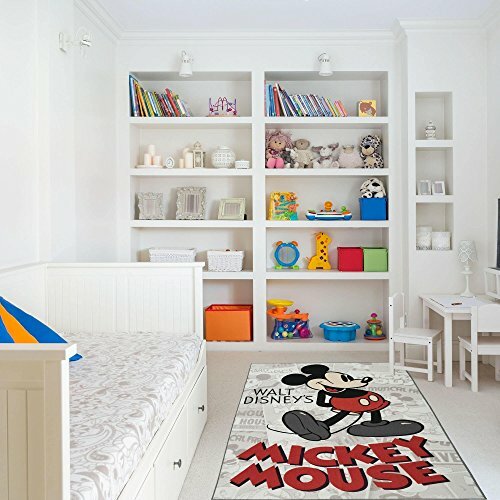 Walt Disney Mickey Mouse Design Kids Area Rug, Graphic Playful Animals Themed, Rectangle Indoor Living Room Doorway Hallway Bedroom Carpet, Vintage Trendy Artwork Pattern, Black, Red, Size 4'6 x 6'6 by Shopping Experts at Animal Backgrounds. Hurry! Limited time offer. Offer valid only while supplies last. Add some Disney vibe into your kid's space with this all new Mickey mouse design that would certainly make your kid's happy. A great item to have. Add some Disney vibe into your kid's space with this all new Mickey mouse design that would certainly make your kid's happy. A great item to have. If you have any questions about this product by Shopping Experts, contact us by completing and submitting the form below. If you are looking for a specif part number, please include it with your message.